Spell Descriptions in Microlite75: By Level or Alphabetical? Should spell descriptions be listed by level as they were in TSR editions of the world’s most popular fantasy RPG or should they be listed in one big list in alphabetical order as they are in 3.x (and many other RPGs). I’ve always liked descriptions group by levels as it makes it easy to compare spells of the same level (but hard to find a spell when you only know its name), but I know a lot of people who really prefer one big list of spell descriptions in alphabetical order. Even a lot of old school gamers who otherwise don’t want much change in their games, prefer the big alphabetical list. For Microlite74, I just went by my personal preference for lists by level. For Microlite75, I’m asking for your opinion in the comments. Which do you prefer I use in Microlite75 — and why? The Brown Box Dungeons and Dragons Goodies Cancer Fund Drive continues for a few more days (until February 15th). 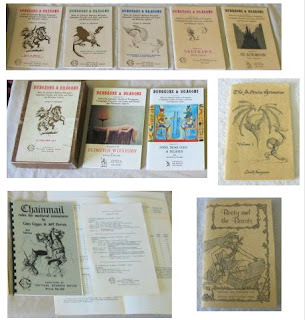 For more information on this giveaway and fund drive see this post: Brown Box Dungeons and Dragons Goodies Available (for Cancer Fund Donors).Lots of donated D&D items to give away in a very good cause. I prefer by level, both because I'm lazy and because I like renaming spells. I'm a big fan of changing names and descriptions of well known spells to personalize spell books. Having spells listed by level makes that much easier for me to do that. By level is great when creating character and when leveling. Alphabetical is great when actually playing. Really can't say which is better. But, if you go alphabetical you absolutely *must* include a separate by level chart of spells. Not having to "waste" that space might be reason enough to go with by level. Personally, I'd like to see spells on cards. But, that is probably not feasible for you. At the very least, by level, but a master alphabetical list would be a great bonus. Pick whichever you think fits, but include the other as a separate index and, if appropriate, add a sphere/school based listing too. By level and then alpha within level. I also like OSRIC's index at the beginning of the book which lists spells, items and monsters by alpha. Generally, you just need to provide an index in the opposite organization. That might be overkill for Microlite75. Personally, I prefer “by level” for the same reason you cited. Why not just produce both and let people choose whichever one they want to print? As Robert pointed out, an spell index would not be very useful for Microlite74 given that there are 20-30 spell descriptions per page. However, if I decide to go with alphabetical order I might be able to put the names of first and last spell on the page in the page header. That would probably be more useful in practice than a full spell index. Doing two versions of the rule book is probably more work than I have time for, especially as there would actually six versions to do: a "microlite style," "two-column booklet style with illos" and the "special edition style" for each type of spell list. I know when to "just say no" and the time is now. In the game I'm working on, I list them all alphabetically for easy reference, but I also provide categorized lists at the start of the chapter to make it easier to find things by level/degree, type/tradition, and so on. Having recently gone back to my old school books, it's more difficult to find things when listed by class and level, IMHO. My personal preference is by level, with a master list that's alphabetical. By level, but with an alphabetical index. Descriptions should be alphabetical, with a level-based index list for character creation and what-not. The usefulness of the spell descriptions is mostly in play, when you want to know with as little trouble as possible just what a spell does — if the descriptions are arranged by level, then you will have two-step process (at least) to find the spell instead of just jumping straight to it in a rationally-arranged organisation. Seriously, I can think of no practical justification for arranging descriptions by level except pure nostalgia value. It's less useful and harder to use in play. Randall: Ah. If I was making that many versions, I’d be trying to generate them all from a single source text. If you’re doing all those version by hand, then, yeah, offering different versions with both listings isn’t practical. Fitz: I did find the alphabetical listings in 3e harder and more frustrating to use. Frustrating enough that I wrote a script to parse the spells out of the SRD so that I could create class/level listings. I found the short descriptions in the class/level index useless when choosing spells. I had to resort to very frustrating flipping among several pages. When I actually cast a spell, I already knew my class and the spell’s level, so finding the spell by class+level would have been just as easy. Likewise, when DMing, I generally know the class & level of a spell I need to look up. The alphabetical listing does have two advantages. There is no need to repeat a spell or say “See the cleric spell of the same name”. (The “see…” entries in 1e frustrated me as well.) Also, on the rare occasion where a spell is referenced outside the context of a class and level, alphabetical is helpful, but an alphabetical index takes care of that less common case. You may find alphabetical listings easier, you may not be able to understand that other people don’t, but some of us do. Robert took the words out of my mouth with respect to why I prefer alpha by level in his last comment. However, I have to wonder if which seems easier does depend — in many cases — on which type of spell list arrangement one used most when one started to play. I'm still undecided on which to use. Next story Action Points in OD&D?